Though originally scheduled to end today, developer Naughty Dog Studios has extended the Uncharted 3 beta test for an additional 24 hours. Additionally, Naughty Dog has unveiled a limited selection of the game's player profile stats, which can be accessed by players on the firm's site. We wanted to be sure that everyone who is looking forward to the Uncharted 3 Beta rewards have an opportunity to check up on their progress. This will allow you to do that -- the Uncharted 3 Beta stats allows you to check your level and go through your game history to figure out how many games of each gametype you've played. We've thrown in a few more, basic, profile stats like kills, deaths, headshots, wins, losses and the time you've spent playing either Competitive gametypes or Cooperative gametypes. 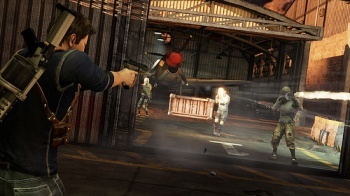 We're looking forward to the October and November, when the FULL Multiplayer mode of Uncharted 3 will be available - which will have a comprehensive package of stats displayed on a redesigned NaughtyDog.com. -Download the Uncharted 3 Beta and receive the exclusive UNCHARTED 3 PSN Beta Tester Avatar! -Complete 10 matches in every mode of Competitive Multiplayer and receive the Exclusive Beta Decal Pack 1! -Complete 5 matches in every mode of Co-operative Multiplayer and receive the Exclusive Beta Decal Pack 2! -Complete 4 Treasure Sets and receive the Treasure Hunter's Starter Pack! -Rank up to level 25 in the Beta and receive a handsome reward of in-game cash on day one! Of course, that's also an additional 23 hours to hope against hope that Nathan Fillion lands the lead role in the game's inevitable film adaptation. Fingers crossed!